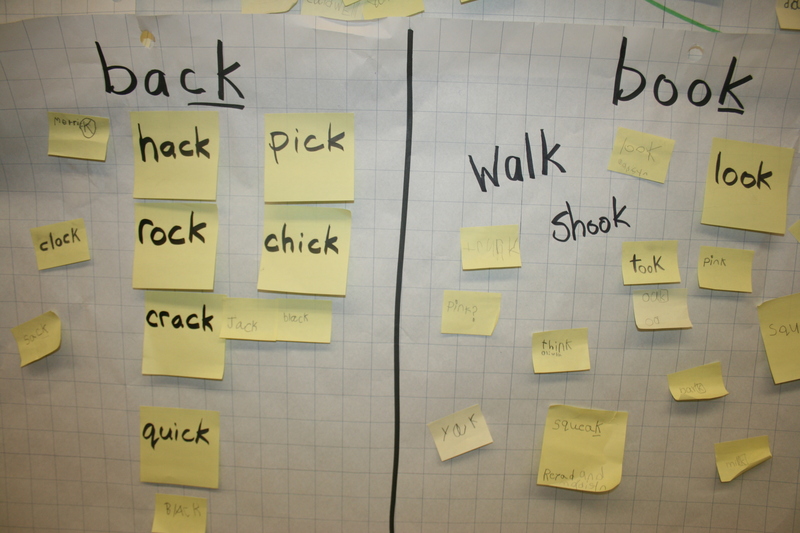 Where structural learning about spelling is going on there are collections of words that will be part of the ‘raw material’ from which we can construct, test and develop hypotheses about the spelling system. The Real Spelling Tool Box employs the concept of the ‘evidence bank’ for such collections. Real spellers always look for essential concepts and processes that underlie and account for the spelling system. The ‘evidence’ for these concepts and processes is ‘evident’ in every text that we see – the base element of evidence is, of course, the twin base ‘vide / vise’ “see”. Your young real spellers are collecting, sorting and analysing evidence from what they see in text itself. To resource your own understanding of the structure of ‘idea’, you can download a draft film called ‘In Search of the Medium-Sized Idea’ from this link. It is part of a ripost to a currently fashionable buzz-system that peddles such terms as ‘enduring understanding’ (if its isn’t ‘enduring’, then whatever it is, it isn’t an ‘under + STAND + ing’), together with Donald Duck’s catchphrase “What’s the big idea?”, and the hallucinating notion of ‘designing’ backwards (perhaps, then, this system could be called ‘Ngised’!). Your merry band of orthographers are most definitely moving forwards! My dear Grouch, thank you once again! The film is delightfully informative and hilarious. I was strung happily along: at each point that I had a new question–“Wait, what about ‘ideal’? ?–there you were. Masterful, from the master. Skot: I loved your classroom discoveries and your bullet points for explanations making it all very clear, easy to follow. You seem to have many workers and not one chief! Brilliantly done. Thank you so much for sharing not only the learning of your students — but your learning about their learing, Skot. A quick look at the photograph at the top of your post, and a brief (ha ha!) reading of your text makes it clear that the experiences with print you are offering your students has motivated them to investigate for important structures inside written words. What is the source of that motivation? Understanding. The scientific investigations your students do to find the ways different phonemes are represented foster a habbit of developing and testing hypotheses about structures in words. Children get to explore, but they are also guided by the real structures within words. Students make mistakes by including a grapheme that doesn’t fit — and thus they learn that that grapheme can represent more than phoneme. 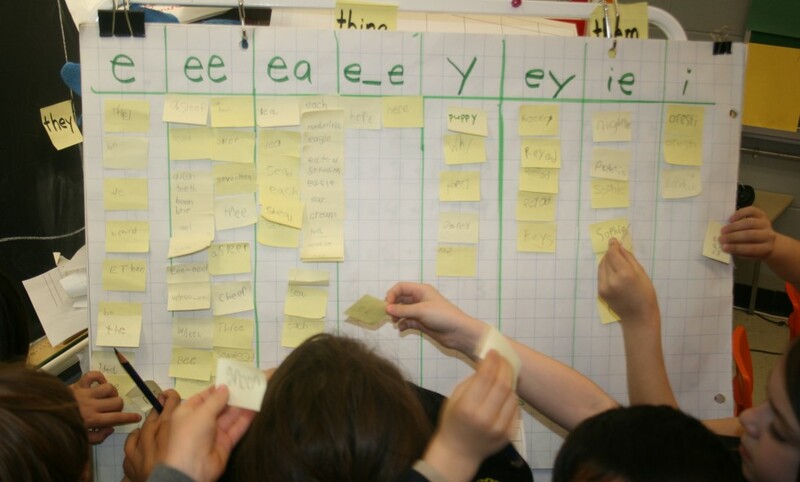 Students find a word like “idea” that raises a question for you about the structure of the word “idea” and now the students get the joy of raising a question that makes their teacher think. You are not practicing inquiry with lessons for which you know all the answers — you are actively doing inquiry with them. 1) What was the last rich question your students have asked you about spelling that was sparked by your instruction? 2) What intersting new fact about how our writing system works have you yourself learned, or what interesting spelling-meaning connection have you yourself made as the result of your spelling instruction you have offered your students? I’m not sure there is a better way for us to assess our instruction than to consider the quality of the questions that instruction prompts. I can’t wait to share your post with the teachers I’m working with right now! ‘Help them to see and wonder.’. and Skot this is the gift you are giving your kids. There is so much within this process of sorting, classifying, gathering data and reflecting on what you are doing that is crucial for learners of all ages. The hunt for the long graphemes is engaging, active and empowering.. look at the flurry of hands as the kids cluster around the chart so keen to share their discoveries. As you stated, this is not just about ‘spelling’ but helping them ‘learn how to learn’. I am so impressed by your reflections on this process. At no stage in any of your posts do you ever claim to have ‘the method” or suggest that you are ‘an expert’ of teaching, that you have reached the pinnacle …..you are open, reflective and doubtful and in embodying and modelling these attitudes, you are, therefore, going deeply into words and beyond words to become a co-learner with your students, an instigator of critical reasoning and an ‘awakener’ ( is there such a word?) to the joy and love in learning. You show that this is done through research, analysis, and that this is often social and collaborative. You, Skot, with your questions, doubts, uncertainties about process and in allowing collaborative ‘investigation’ to be the linchpin of your approach to word study, encourage your students to think critically and reflectively. They will be better readers, writers, students and ‘small humans’ for this. I really appreciate the reflective tone in your posts, Skot. You genuinely want to do what’s best for the students and are therefore constantly questioning the effectiveness of various activities. I also love how ALL of what you’ve done with your first graders is applicable to students in the Grade 5 classroom. We’ve done the very investigations you’ve outlined in this post! I am hoping to partner with a first grade buddy class next school year to do regular Real Script activities and the orthography investigations that inevitably accompany them. It will be valuable for the first graders but even more so for the fifth grade students. Thank you, friends, for all your comments. Perhaps it is my own compulsive need to question everything I do (or see, or read) that makes me suitable to the task of teaching in this way, where students are invited to question and hypothesize. I suspect/know many of you are the same. One of the things I have questioned is whether these very new readers will be overwhelmed–and potentially confused or delayed in their full understanding–by the hugeness of what we cover through this work. I do see this. Some would say that it is better to give them less, ensure they fully grasp it, and then broaden. The problems with this I see are, a) the language is complex, so pretending it is otherwise seems false; and, b) it is difficult to limit what they will see, and therefore wonder about, so again there seems a kind of dishonesty to pretending there isn’t more. And who are we to say what amount they can handle, or, more mysteriously, what they will understand more or less easily? Evidence would suggest that this varies. As the school year draws to a close and I am therefore having to measure against benchmarks and so forth, I see that many of my students do not have an utterly solid grasp of some of what we have covered. This is hardly surprising. But I am reassured by a couple of things. Firstly, when I read with them, I see a capacity in all of them, without exception, to identify the structure of words–even if they still need some reminding to look. For instance, they might get stuck on the word ‘staying’, but with a prompt to spell it aloud, I can clearly hear that they recognize an ‘ay’ digraph, and a suffix ‘ing’. Some still need a nudge to recall what the ‘ay’ is likely to represent. Yesterday, a child brought to us the word ‘extinguisher’ and so, because I had just been working on this process with a couple of emerging readers who were still stuck on a letter-by-letter ‘sounding out’ that was not working for them (where do they get this? ), I asked the class to simply identify everything they could about the word, wherever they found it (ie. not necessarily working from left to right). Together, identifying digraphs, suffixes and prefixes, we revealed the word, a working stem (the base eludes us) from which we could build related words, and our own fearless capacity for taming “dragon” words.